Gregg Charles Popovich (born January 28, 1949) is an American professional basketball coach and general manager. He is the head coach and President of the San Antonio Spurs of the National Basketball Association (NBA). 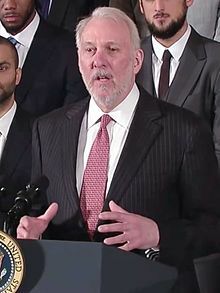 Taking over as coach of the Spurs in 1996, Popovich is the longest tenured active coach in both the NBA and all major sports leagues in the United States. He is often called "Coach Pop" or simply "Pop." Popovich has the most wins in NBA history (regular season and playoffs), surpassing Lenny Wilkens and Don Nelson on April 13, 2019. He has led the Spurs to a winning record in each of his 22 full seasons as head coach, surpassing Phil Jackson for the most consecutive winning seasons in NBA history. During his tenure, the Spurs have had a winning record against every other NBA team. Popovich has led the Spurs to all five of their NBA titles, and is one of only five coaches in NBA history to have won five titles. Popovich was born in East Chicago, Indiana, on January 28, 1949, to a Serbian father and a Croatian mother. He started his basketball career playing Biddy Basketball and was on the 1960 Gary Biddy Basketball All-Star Team that finished third in the World Tournament, held at Gary's Memorial Auditorium. He attended Merrillville High School and graduated in 1970 from the United States Air Force Academy. He played basketball for four seasons at the Academy and in his senior year was the team captain and the leading scorer. He graduated with a bachelor's degree in Soviet Studies, and underwent Air Force intelligence training. He later earned a master's degree in physical education and sports sciences at the University of Denver. At one point, Popovich considered a career with the Central Intelligence Agency. Popovich served five years of required active duty in the United States Air Force, during which he toured Eastern Europe and the Soviet Union with the U.S. Armed Forces Basketball Team. In 1972 he was selected as captain of the Armed Forces Team, which won the Amateur Athletic Union (AAU) championship. This earned him an invitation to the 1972 U.S. Olympic Basketball Team trials. Popovich returned to the Air Force Academy as an assistant coach in 1973 under head coach Hank Egan, a position he held for six years. Egan later became an assistant coach under Popovich for the San Antonio Spurs. During his time with the coaching staff of the U.S. Air Force Academy, Popovich attended the University of Denver and earned his master's degree in physical education and sports sciences. In 1979, he was named the head basketball coach of Pomona-Pitzer's men's team. Popovich coached Pomona-Pitzer men's basketball from 1979 to 1988, leading the team to its first outright title in 68 years. During his time as head coach at Pomona-Pitzer, Popovich became a disciple and later a close friend of head coach Larry Brown at the University of Kansas. Popovich took off the 1985–86 season at Pomona-Pitzer to become a volunteer assistant at Kansas, where he could study directly under Brown. Popovich returned to Pomona-Pitzer and resumed his duties as head coach the next season. Following the 1987–88 season, Popovich joined Brown as the lead assistant coach for the Spurs. From 1988 to 1992, Popovich was Brown's top assistant, until the entire staff, including R. C. Buford, Alvin Gentry and Ed Manning, were fired by owner Red McCombs. Popovich moved to the Golden State Warriors for a brief stint in 1992, serving as an assistant under future Hall of Famer Don Nelson and bringing with him Avery Johnson, who had been cut by the Spurs. In 1994, Popovich returned to San Antonio as the general manager and Vice President of Basketball Operations after Peter Holt purchased the team. Popovich's first move was to sign Avery Johnson as the team's starting point guard. Another one of Popovich's early moves in San Antonio was to trade Dennis Rodman to the Chicago Bulls for Will Perdue. Rodman was not fond of Popovich, as Rodman said in his first book Bad As I Wanna Be. After the Spurs had a 3–15 start in the 1996–97 season, with David Robinson sidelined with a preseason back injury, Popovich fired coach Bob Hill and named himself head coach. Robinson then broke his foot after only six games and was lost for the season. Sean Elliott was also limited to 39 games due to injury, and Chuck Person missed the entire season. With a reduced roster that included an aging Dominique Wilkins, the Spurs struggled and won only 17 games for the remainder of the season for an overall record of 20–62. The Spurs' disastrous season allowed them the first overall pick in the 1997 NBA draft, which they used to draft Tim Duncan out of Wake Forest University. The Spurs blossomed as the 6'11" Duncan teamed up with the 7'1" Robinson in a "Twin Tower" offense and defense for several years. After recovering to win 56 games in 1997-1998 (Popovich's first full year as coach), the Spurs came won their first NBA title in 1999. In 2002, Popovich relinquished his position as general manager to R. C. Buford, who had served as the team's head scout. Popovich and Buford were both given their starts in the NBA in 1988 as assistants on Brown's coaching staff with the Spurs. Popovich has won five championships with the Spurs—1999, 2003, 2005, 2007 and 2014. He was named NBA Coach of the Year in 2003, 2012, and 2014. On April 4, 2008, Popovich returned to the U.S. Air Force Academy to receive the academy's award of Distinguished Graduate. Despite his four NBA titles at the time, Popovich said it was the most meaningful award he had ever received. On May 2, 2012, Popovich won his second Coach of the Year Award for the 2011–12 NBA season. On November 29, 2012, Popovich sat out starters Tim Duncan, Tony Parker, Manu Ginóbili, and Danny Green for a nationally televised game against the Miami Heat. Popovich has frequently sat out his starters on road trips over the years to ensure they have enough rest for the playoffs; the Spurs' roster was among the oldest in the league. NBA commissioner David Stern was outraged by this and said on the night of the game that it was "unacceptable," and "substantial sanctions [would] be forthcoming." On November 30, Stern fined the Spurs $250,000 for what he called "a disservice to the league and the fans." According to Stern, Popovich had not informed the Heat, the league or the media in a suitable time frame that the four players were not making the trip to Miami. Stern's decision was criticized by commentators such as Adrian Wojnarowski of Yahoo! Sports, who said, "Stern doesn't care about the realities of his league, just the appearances. To him, the appearance on Thursday night was that Popovich had tried to embarrass him on national television and that's why the commissioner tossed that tantrum." Popovich led the Spurs to the 2013 NBA Finals to face the Miami Heat. The series lasted seven games, but the Spurs had their first ever Finals loss. On April 22, 2014, Popovich was awarded the Red Auerbach Trophy as he won the NBA Coach of the Year for the third time. He also won his fifth NBA championship with San Antonio that season, beating the Heat 4–1 in the Finals. On February 9, 2015, Popovich became the ninth coach in NBA history to win 1,000 games when the Spurs defeated the Indiana Pacers 95–93. He and Jerry Sloan are the only two coaches in NBA history to win 1,000 games with one franchise. On August 1, 2015, Popovich served as Team Africa's head coach at the 2015 NBA Africa exhibition game. In the 2015–16 season, Popovich led the Spurs to a franchise high 67 wins, but he and the team lost in the conference semifinals against the Oklahoma City Thunder in six games. On February 4, 2017, Popovich recorded his 1,128th win with one franchise, surpassing Sloan. On April 13, 2019, Popovich surpassed Lenny Wilkens and became the all-time winningest coach in NBA history with his 1,413th win. Popovich served on the coaching staff for the U.S. national team during the 2002 FIBA World Championship (assisting George Karl), during the 2003 FIBA America Men's Olympic Qualifying Tournament, and during the 2004 Olympic Games, where the U.S. won a bronze medal. On October 23, 2015, Popovich was named head coach of the U.S. men's national team, taking over from Mike Krzyzewski after the 2016 Olympic Games. Popovich with Secretary of Defense William Cohen and Spurs' player David Robinson speaks at Junior ROTC cadets from local high schools. On multiple occasions, Popovich has spoken out on behalf of social justice issues, including in support of the Women's March. He has also repeatedly criticized the behavior of President Donald Trump. Popovich was married to Erin Popovich until her death on April 18, 2018; the couple had two children. Popovich has spent considerable time and money working with several charities and nonprofits the likes of San Antonio Food Bank and Innocence Project. He also took part in Shoes That Fit, an organization that aims to deliver shoes to more than 200 students at Gates Elementary School affected by Hurricanes Irma and Maria. Popovich is helping raise funds for J/P HRO, a disaster relief program that operates in Haiti, and various disaster relief organizations in the U.S. and Caribbean. ^ Wetzel, Dan (June 14, 2007). "French connection". Yahoo! Sports. Retrieved April 17, 2008. ^ "Devin Brown And Coach Pop Spread Message To Local Youth". NBA.com. February 1, 2004. Archived from the original on July 27, 2008. Retrieved March 5, 2008. ^ "Gregg Popovich Named 2017–20 USA National Team Head Coach". USA Basketball. October 23, 2015. Retrieved February 11, 2016. ^ "2018–19 Official NBA Guide" (PDF). NBA.com. p. 197. Retrieved November 1, 2018. ^ Wojnarowski, Adrian (June 10, 2007). "'Pop' art". Yahoo! Sports. Sometimes, you get the idea that Popovich is fighting a war within himself. "He's even got the Serbo-Croatian conflict going on," Buford said. "His mother was Croatian and his father was Serbian. That's the battle he faces internally." ^ David L. Porter (2005). Basketball: A Biographical Dictionary. Greenwood Publishing Group. pp. 380–. ISBN 978-0-313-30952-6. ^ a b Draper, Kevin (January 21, 2017). "Gregg Popovich Expresses Support For The Women's March, Again Criticizes Donald Trump". Deadspin. Retrieved March 22, 2017. ^ Association, National Basketball Conditioning Coaches (2007). Complete Conditioning for Basketball. Human Kinetics. p. 6. ISBN 978-0-7360-5784-4. ^ "Popovich is a man of mystery. National Post". National Post. June 15, 2007. Archived from the original on September 5, 2012. ^ "Gregg Popovich honored at Air Force Academy". KOAA. April 4, 2008. Archived from the original on December 1, 2008. ^ Official Release. "Spurs' Popovich named Coach of the Year". Archived from the original on May 7, 2012. ^ David Stern: Sanctions coming. ESPN, November 30, 2012. ^ Spurs fined $250,000 for 'disservice'. ESPN, November 30, 2012. ^ Adrian Wojnarowski (November 30, 2012). "David Stern stumbles again in his failed culture war against the Spurs, fines franchise $250K". Sports.yahoo.com. Retrieved October 2, 2016. ^ "Spurs' Gregg Popovich named 2013–14 Coach of the Year". Nba.com. Retrieved October 2, 2016. ^ "NBA stars, legends shine as Team World rallies to beat Team Africa". Espn.go.com. August 1, 2015. Retrieved October 2, 2016. ^ "Gregg Popovich gets NBA-record 1,128th win as Spurs beat Nuggets". nbcsports.com. February 5, 2017. Retrieved February 5, 2017. ^ "NBA Playoffs 2019: Spurs' Gregg Popovich becomes winningest coach in NBA history". www.cbssports.com. Retrieved April 14, 2019. ^ "Gregg Popovich Named 2017–20 USA National Team Head Coach". USA Basketball. October 23, 2015. Retrieved October 24, 2015. ^ Cacciola, Scott (November 12, 2016). "Emboldened N.B.A. Coaches Rip Donald J. Trump's Rhetoric". The New York Times. ISSN 0362-4331. Retrieved May 15, 2017. ^ Babb, Kent (February 17, 2017). "Gregg Popovich has found the opponent of his life: President Trump". Washington Post. Retrieved May 15, 2017. ^ Savransky, Rebecca (May 14, 2017). "Spurs coach Gregg Popovich goes after 'embarrassing' President Trump". TheHill. Retrieved May 15, 2017. ^ Mendoza, Madalyn; Rohlin, Melissa (September 25, 2017). "Popovich slams Trump's 'childishness,' 'gratuitous fear-mongering' after political sports weekend". San Francisco Chronicle. Retrieved September 25, 2017. ^ "Spurs announce that Gregg Popovich's wife Erin Popovich has died". ^ "Popovich: If you're 'rich as hell,' give to charity". ^ "Gregg Popovich stands up for charity: 'We're rich as hell, and we don't need it all'". ^ "1986 Division III men's basketball tournament". D3hoops. Retrieved October 2, 2016. Wikimedia Commons has media related to Gregg Popovich. This page was last edited on 20 April 2019, at 23:22 (UTC).